Where can I get the best deal on an iPad or iPad Mini During Black Friday? Based on sheer volume of email requests, I know that one of the most popular items on many wish lists this year is a new iPad. And of course, no one wants to pay more than they have to! That’s where this post comes in: I’m here to tell you exactly where you can get the best Black Friday deals on the iPad and iPad mini. Both Best Buy and Target will be offering discounts on the just-released iPad Air 2, which is a huge departure from last year’s “Older Generation Only” approach to the Black Friday sales. If you have to have the newest technology, you are in luck! Best Buy will have the best straight-up pricing on the iPad Air 2 – with $100 off all models and configurations of the iPad Air 2 (16GB, 64GB and 128GB). The sale price for the 16GB wifi iPad Air 2 will be $399.99; the 64GB will be $499.99 and the 128GB will be $599.99. These prices will only be available during Best Buy’s Doorbuster Sale – from Thursday, November 28 @ 5 pm until Friday, November 28th @ 1 am. Tickets will be handed out starting from 3 pm on Thursday. No rainchecks, and quantities will be limited. Best Buy may also release a limited number of the iPad Air 2s online at this same price – but based on how quickly last year’s iPad Minis sold out, I would’t hold my breath for getting one. 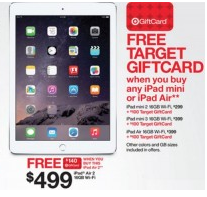 Target will also have an iPad Air 2 deal. The price won’t be discounted ($499), but Target will give you a whopping $140 gift card with your purchase of the 16GB iPad Air 2, making your effective after gift-card price $359. While this beats Best Buy by $40, you have to wisely use your $140 Target gift card to maximize your savings. Otherwise, you may be better off at Best Buy. The Target Black Friday Ad does note that other GB sizes will be included, but doesn’t specify prices yet. All Target stores will be open for Black Friday Sales from 6 pm on Thursday, November 27th except for stores in Massachusetts & Rhode Island, which are slated to open at 1 a.m. on Friday, November 28th. If you don’t have to have the latest model, Walmart will be offering last year’s iPad Air (16GB) for $397, plus you’ll get a $100 gift card, making it just $297 after gift card. Best Buy will also be selling last year’s iPad Air during their pre-Black Friday Week of Sales, but they aren’t releasing the price until November 20th. Expect them to match Walmart – or come very close. Target will be selling the iPad Air for $399 (the regular price), but offering a $100 gift card, making the effective price just $2 more than at Walmart. Sam’s Club will also have the original iPad Air for $299, available online or in-stores. Best Buy is putting all entry-level configurations of the new iPad Mini 3 on sale for $75 off. The 16GB iPad Mini 3 will be $324.99. Note that this is the just-released version of the iPad Mini – again a departure from last year, when only the 1st generation went on sale. Meanwhile, Target will sell the iPad Mini 3 16GB for the regular price of $399.99, but will give you a $100 Target gift card, making the effective price on the iPad Mini 3 just $299.99. Target will have last year’s iPad Mini 2 16GB priced at the regular price of $299, minus a $100 Target gift card, for an effective price of $199 on the Mini 2. Conisdering that the iPad Mini 2 has retina display, I’d say that this is a much better offering than the below deals on the original, non-retina iPad mini. Target will have the non-retina 2012-model iPad Mini 16 GB priced at $249 with an $80 gift card, making your effective price $169. Walmart will match that with their offer of the 2012 16GB iPad Mini for $199 with a $30 gift card (effective price $169). Last year, closer to Black Friday, eBay and Rakuten got into the fray, offering lower, non-gift card prices on both the iPad and iPad Mini. Stay tuned — I promise to update this post if there are any new offers worth mentioning in the hunt for the best-priced iPad.